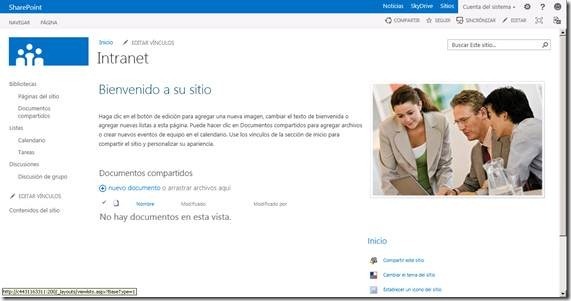 How to upgrade to SharePoint 2013 Public Preview with CloudShare! If you want to move a site from SharePoint 2010 to SharePoint 2013 Public Preview, you cannot use the In-place upgrade method and related upgrade hybrid approaches available when upgrading from SharePoint 2007 to SharePoint 2010. At the moment, there is only one valid approach to upgrade to a CloudShare SharePoint 2013 Public Preview environment, and that is by making a content database attach upgrade to a new SharePoint 2013 public preview farm. This means you will have to make a backup of your existing content databases and restore them on a SharePoint 2013 farm. Available content databases indicating the name, any issues or customizations identified, etc. Services running on the farm and the farm topology. You should include what services running are being used in remote farms, the name of the Service Applications databases, custom configurations done, and so on. At the web application level, you have to document any configuration related to alternate access mappings, authentication methods and providers being used, managed paths, etc. You should also identify any feature installed and also configurations at the web.config level. Once the farm is fully documented, you can go ahead with the content databases upgrade process. SharePoint 2013 Public Preview allows you to upgrade content databases as well as some service applications by using this approach. Indeed, you can upgrade the following service applications databases: Project Server, Search Administration, Social, Managed Metadata and Secure Store Service database. First, you have to make a backup of your content database in your CloudShare SharePoint 2010 environment. Once the backup is ready, copy it to your CloudShare SharePoint 2013 environment by using Cloud Folders capability. Start SQL Server Management Studio, connect to your SQL Server instance on the server, and restore the SharePoint 2010 content database backup by using the “Restore Database…” menu option available at the Databases folder. In the “Restore database” window, specify the name of the database to be restored and the path where the backup is located. Click the “Ok” button in order to start the restore process. Once the content database is restored on the SQL Server instance, go to the SharePoint 2013 Central Administration and create a new Web Application. In my case, I have created a web application using the 200 port number. If the command execution detects issues in the content database, you will be notified in the output window. For instance, a common issue is to have orphan objects in the content database. As you can see above, Test-SPContentDatabase has found some issues (like missing Language Pack, missing Site Definition) in the content database that must be solved in order to make a successful upgrade. As a result, in the output window you will see the ID assigned to the content database in the CloudShare SharePoint 2013 Public Preview environment, the web application assigned, and the number of sites available. You will also see any issues found when adding the database to the web application. 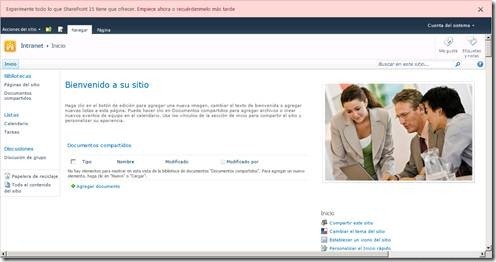 In this case, there is a problem with a site collection used for caching purposes for Office Web Apps in SharePoint 2010. Since these kinds of site collections are not supported any more in SharePoint 2013, you don’t have to make any further action. You can verify the result through the “Manage Content Databases” page available at the SharePoint 2013 Central Administration. Of course, you can also check what site collections have been added to the web application once the upgrade process has finished. As you can expect, any of these sites have a SharePoint 2010 look & feel in order to ensure the site is completely functional. Once you are sure the site works as expected, you can upgrade the site collection to SharePoint 2013 mode by using the links available on the status bar at the site home page. For instance, below is how the same site looks in SharePoint 2013 mode. And that’s all you have to do to upgrade SharePoint 2010 content databases to a CloudShare SharePoint 2013 public preview environment by using the database attach technique. Happy CloudSharing!